If there’s one thing I associate with the Czech Republic (other than beer), it’s the country’s long and distinguished history of working with glass. Czech glass is world renowned for it’s quality and craftsmanship. 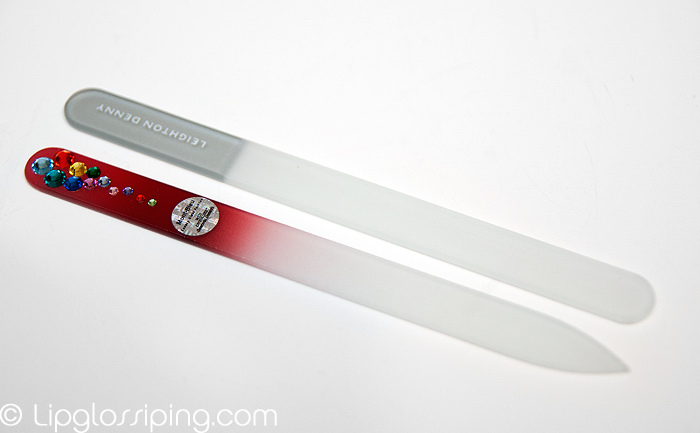 I took delivery of a sample nail file a few weeks ago from Mont Bleu, a company based on the outskirts of Prague who produce tempered glass nail files by hand. It arrived in a substantial leatherette mock-croc gifting box. 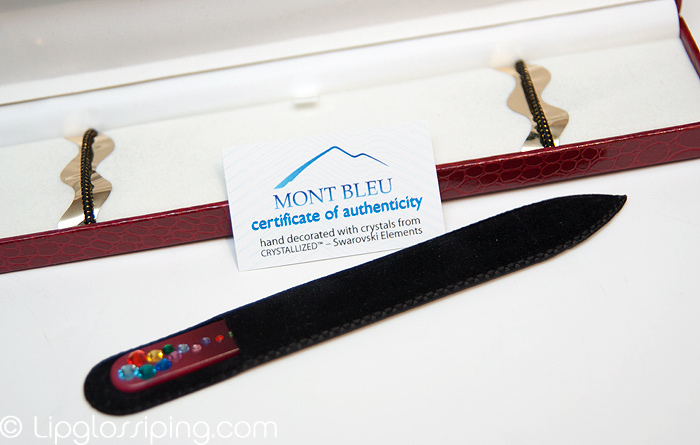 The nail file itself is tucked inside, housed in a velvet pouch and arrived with an authenticity card. All these little extra touches really single a product out as being gift-worthy! 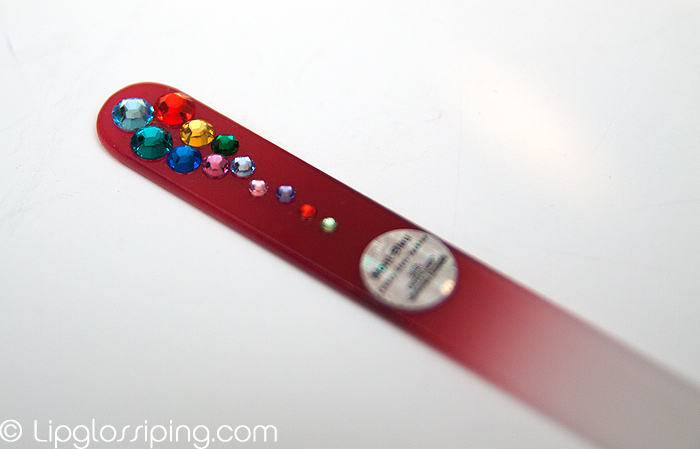 I received the Red Medium Nail File with Swarovski Crystals in a ‘marbles’ design which you can view online here. It’s a well-made product as one might expect and is comparable to my Leighton Denny file in both size and quality. I’ve used it daily to give it a thorough wear test and so far, the surface has remained as pristine as the day it arrived. My one distinction in the quality between them would be that the Mont Bleu file feels ever so slightly “grittier” when filing than the Leighton Denny. I’m not 100% sure on this and have been wavering and asking everyone who visits to weigh in with an opinion. It’s divided everyone! The Mont Bleu files are available in a variety of designs and can be bought online in the UK through their distributor BestCrystalNailFiles. Priced at £10.99 for a medium size, it’s a lovely gift choice for Mothers everywhere this Mother’s Day. That is so beautiful and well presented that I think I would feel bad using it as a nail file! Looks like it should be displayed! That’s gorgeous. Very luxe for a nail file. Oh that is one beautiful nail file! It looks lovely but what happens if the dog chews it? My mother leaves all her nail files lying about and they are frequently nibbled. Could be nasty! Argh, I read ‘Mont B’ and my heart stopped, for a second thinking it’d be ‘Mont Blanc’ coming out with a nail file! Looks very pretty and decadent.